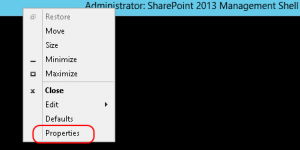 In Command Prompt or PowerShell windows you can paste by right-clicking. But not always… Why? Right-click the top bar and select properties. 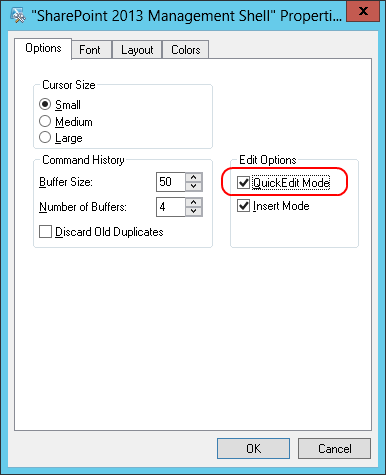 Select the Options tab and make sure the edit option ‘QuickEdit Mode’ is selected. Now the right-click paste is working. Besides the right-click paste you’re getting now, also the instant ‘Mark’ is available. 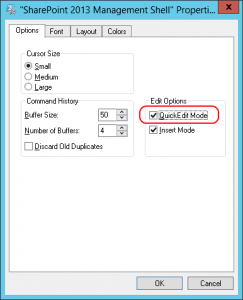 By left-clicking you can select text, press Enter or right-click and the selected text has been copied to the clipboard. This functionality isn’t new, but very neat! A known function is the up arrow key: with this command you can traverse through the commandline buffer and select one of the previous commands. Another option is the F7 key (Alt-F7 to clear the history). It shows a menu of previously run commands! This command history comes from the console-hosting application, not from PowerShell. 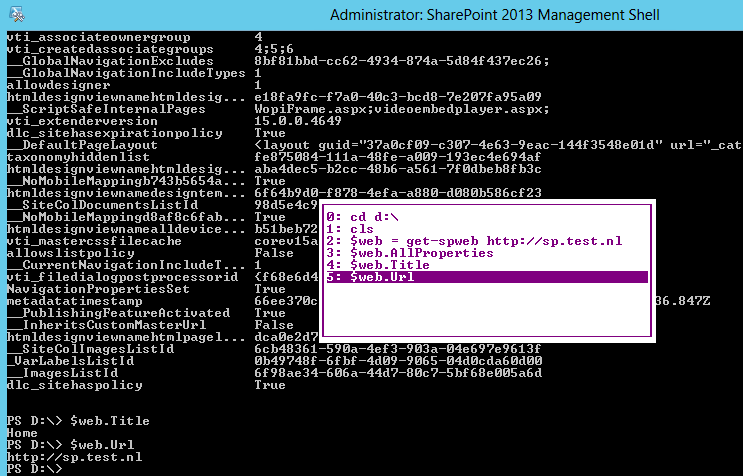 Get-History shows loading sharepoint.ps1 while the console history isn’t aware this command has even been executed.